One would think from looking at the following pictures, that I had a vicious bird when in fact nothing could be further from the truth. Even with the injuries you see pictured in Figure 1 and Figure 2, I still allow Zazu (15 year old female goffin) to get close to my face all the time. I know you are thinking “she’s crazy”, but when you finish reading this article you will understand. I allow Zazu to be on my shoulder because I trust her. Her good behaviour has earned her “shoulder privileges”. The pictures may say the opposite, but believe me when I say that I am responsible for both bites. Bird behaviour is a very, very subtle thing and we miss a lot of the cues that tell us to back off. A dog growls to let us know he is uncomfortable or does not want to do something we’ve requested. We listen to that. Now we’ve entered the territory of parrots and their communication is different from a dog or a cat, or any other animal for that matter. Your bird’s communication that he/she does not want to do something may be as subtle as the slight movement forward of some feathers. We need to train ourselves to watch for these subtle behaviours and to listen, and respect what our bird’s are “telling” us. Biting and screaming are two of the biggest reasons that parrots are rehomed. I will be the first to admit that being on the receiving end of a bird bite is no fun. Those beaks can inflict some serious damage. However, the behaviour I would have to question even more so than the bite, is my own behaviour. 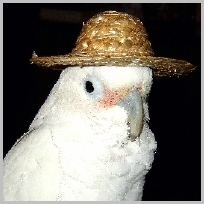 Why would a supposedly sane human being, who has just been bitten on the face by her cockatoo, grab her camera and take pictures while she was bleeding?” Can you explain that to me? Stop shaking your head; I never said I was the smartest banana in the bunch. 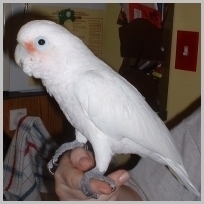 Figure 1 shows the face bite with the lovely 3-point cockatoo beak marks. Figure 2 shows the bite where Zazu punctured the digital artery of my middle finger. Ouch!!! Before I took the Living and Learning with Parrots on-line course, my interpretation of the face bite would have been entirely different than the true interpretation or post-LLP interpretation. My pre-LLP interpretation would have let me off the hook because we humans don’t like to admit that occasionally we do really dumb things (in my case often is more precise). The night Zazu flew at me and bit my face was much like any other night with one exception – I was chewing gum and blowing bubbles. I don’t usually chew gum so this was new to Zazu also. She appeared very interested in the bubbles I was blowing. Appeared is a construct but I did observe that Zazu was 6 inches from my face and was watching my mouth intently. So I just operationalized “appeared” for you so you could “see” the behaviour I saw just before the bite. I was sitting in the chair with Zazu and she just flew into my face and bit me – for no reason. She must be “hormonal” or aggressive, etc. etc. etc. I don’t understand it, she attacked me. One minute I was sitting with her and the next she flew at my face and bit me on the chin. I’ve been so good to her, blah, blah, blah. I buy her all kinds of toys and special foods, why would she do this to me? She is a bad, bad bird! Can you identify the constructs in this paragraph? Remember a construct is only what you think something is and not what is clear, observable behaviour. First of all, this event was never about Zazu’s behaviour but about mine. She was extremely interested in the bubbles I was blowing but every time she went to grab the bubble gum, I sucked it back into my mouth. I did this a couple of times before Zazu decided she really, really wanted that gum and she went for it. As she lunged to grab the bubble, I sucked it into my mouth and unfortunately for me, my chin was in the way and I took a pretty bad face bite as you can see from the picture in Figure 1. Now that’s what happens when you tease a cockatoo. Again, stop shaking your head; remember what I said about the bananas. Human error is to blame for this bite, not my Zazzy girl. Let me do a Functional Analysis for you. Always the behaviour first and it clearly is “Bev teases Zazu”. Possible Future Behaviour: Bev will not tease Zazu anymore so as to prevent future bites. Lesson learned: Bev is an idiot for teasing Zazu in the first place. I knew she wanted that gum. Owning up to our own problem behaviour is 99.9% of the solution. Figure 2 shows a bite that punctured the digital artery of my middle finger. Again, we won’t even discuss the fact that I went and got my camera and took pictures of the injury. Just remember bananas and keep reading. I was getting ready to go to work but noticed that there was some string hanging down from Zazu’s perch. I was in a rush but decided to cut it so she wouldn’t get her toes caught while I was gone. I put my hand in the cage and bang, Zazu bit my hand. She punctured the digital artery of my middle finger. The attack came out of nowhere. She must have been mad at me for something or maybe she was hormonal, etc, etc. etc. I could have come up with lots of reasons why Zazu bit me and all would have blamed Zazu for the bite. I was getting ready to go to work and I was in a rush. I noticed some string hanging from Zazu’s perch so I decided to cut the string so she wouldn’t get a toe caught in it. Zazu was in the cage. Leaving her there was my first big mistake. Taking her out while I cut the string would have been the perfect antecedent change. So I took a pair of scissors (unfamiliar item to Zazu) and put them right in front of her to cut the string and she defended herself against the scissors. Unfortunately, my hand was holding them and I got bitten. Again, human error is to blame for this bite, not Zazu. Solution post-LLP: Remove Zazu from her cage and cut the string. It would have only taken an extra minute or two and I could have prevented this bite. In almost all cases where someone has talked about being bitten, it’s the bird that gets the blame. Birds do not bite without a reason. Behaviour has function and it does not happen in a vacuum. So the reason for the first bite was because Zazu was after the bubble gum and the reason for the second bite is she was protecting herself from a foreign invader. She was in her house (cage) and I came at her with an object (scissors) that she was unfamiliar with. If this was someone entering your home, you would do the same thing to protect yourself. The lesson I learned that morning was do not ever put foreign objects into Zazu’s cage while Zazu is in the cage. It was a painful lesson. All I had to do was remove Zazu for a minute, cut the string and put her back. The thing is we are human and we all make mistakes, but why do we blame our birds for our mistakes. We must take responsibility for our behaviour and acknowledge our role in the development of problem behaviours in our parrots. By following the tenets of Applied Behaviour Analysis we can then decrease or eliminate unwanted behaviours and increase wanted behaviours. And that my fellow parrot lovers is a wondrous thing!!!!! "Zazu"